All advent, this image has been with me. 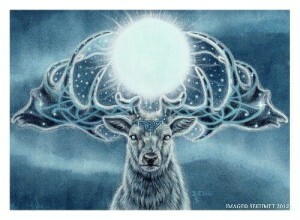 According to Far North mythology, this female reindeer with her tree of life antlers takes it as her duty and responsibility to carry the light through the dark times. She is the faithful keeper of the flame, guardian of the spark of conscious awareness, the one who remembers. She is Mary with her womb full of saving grace. She is everyone of us who tends the common good. This year’s Dream Quests have been about dreaming the Mystery. As always these themes that come to me in the winter give their gifts through the year. My work has taken me to the land of the Dreamtime, whose grace is still working through the pathways of my psyche. The pure beingness of the Australian landscape has installed something new. I’ve learned to be more quiet, letting the teaching I am here to give emerge more in my being than in outward creation. And now in quiet December, Mother Deer reminds me that the light is a gift carried in the intricate antlers of our unique life experiences. Our responsibility is to carry this. So for this Solstice day, as we nestle deep into the dark abiding mystery, may we remember the light we carry, our faithful companion. Love and Grace through the season. This entry was posted in Uncategorized on December 21, 2015 by Judith.